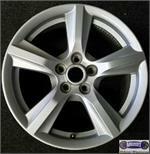 3438b, Used Rims, 16X6, 4 lug, 4-1/4, 00-03, Ford, Focus, 6 spoke bright machined. 6517a, Used Rims, 16X7, 5 LUG, 115MM, 94-'96, PONTIAC, GRAND PRIX. ALUM 5 STRAIGHT SPOKE, PAINTED SPARKLE SILVER. 65790, Used Rims, 16X6, 5 LUG, 4-1/2" 03-06, MITSUBISHI, XLS, SE, OUTLANDER, 5 SWIRL SPOKE, ALUM. 65790, Used Rims, 16X6, 5 LUG, 4-1/2" 03-06, MITSUBISHI, XLS, SE, Outlander, 5 SWIRL SPOKE ALUM. 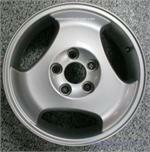 68187, Used Rims, 15X6-1/2, 5 LUG, 110MM, 97-98, SAAB, 9000, 3 HOLE ALLOY. 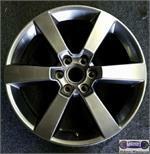 2332b, USED RIM, 17X6-1/2, 5 LUG, 127MM, 08-11, CHRYSLER TOWN & COUNTRY, 9 SPOKE, MACHINED, CLEAR COAT, CHARCOAL POCKETS. 20x10 2007-2013, Replica Mustang Bullet 5x114.3 5x4.5 +35mm Chrome Wheel Rim Inch 20"
1004, Used Rims, 15X6, 5 LUG, 4-3/4", 77-86, BUICK, CENTURY, LESABRE, CHEVELLE, CUTLASS, FIREBIRD, LEMANS, MONTE CARLO, OLDS, PONTIAC, REGAL. BLACK STEEL 4 SLOT. 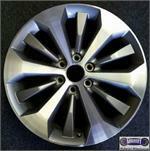 10057a-3035a-1, USED RIM, 16X7, 8 LUG, 6-1/2", 92-16, Ford, F250, F350, Van, E150, E250, E350, E450, 4 SLOT, GRAY STEEL. 1087, Used Rims, 14X6, 5 LUG, 4-1/2", 77-80, LINCOLN, VERSAILLES. ALUM RIM. 1089, Used Rims, 15x6, 5 LUG, 5-1/2", 77-81, Ford, Bronco. TRUCK. ALUM 5 SLOTS.